The Community Foundation of Middlesex County recognizes the importance of protecting the information we may collect from those who visit our website. Our policy is to use the information we acquire from visitors to our website for internal purposes only. We maintain appropriate security measures to keep this information private. If anyone expresses to us that they do not wish to have their information used as a basis for further contact, we will respect those wishes. If anyone wishes to review, edit, or correct the personal information that we have collected, please contact the Community Foundation at 860.347.0025. The Community Foundation takes precautions to keep user information that is provided to us secure. Such information will never be disclosed to third-party vendors for commercial purposes. To prevent unauthorized access of our information, to maintain accuracy of our data, and to ensure the appropriate use of information, we have the appropriate physical, electronic, and managerial procedures to safeguard the information we collect. The Community Foundation of Middlesex County recognizes the importance of protecting the information we may collect from donors, prospective donors, volunteers, nonprofits, staff, and those who visit our website. Our policy is to use the information we acquire for internal purposes only. We maintain appropriate security measures to keep this information private. The Community Foundation of Middlesex County is fully aware that in order for the Community Foundation to operate in an efficient manner, donors, prospective donors, volunteers, nonprofits, and staff records must be maintained and managed in a professional manner. These records may contain sensitive information that has been shared with the Community Foundation on a confidential basis. The term “records” extends to all files kept by the Community Foundation, including electronic data on donors, prospective donors, volunteers, nonprofits, and staff of the Community Foundation. Donors, prospective donors, and volunteers may be attracted to the Community Foundation on the basis of its ability to assure temporary or permanent anonymity upon request. The assurance and protection of donor/volunteer anonymity is an important part of providing excellent service to the community. The names of all donors are printed in the Community Foundation’s annual report and other appropriate listings, unless otherwise requested by an individual donor. 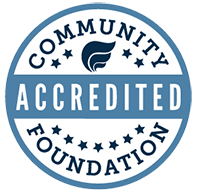 The Community Foundation prides itself in keeping any promise of temporary or permanent anonymity requested by any donor. Any donor who does not explicitly request anonymity will have their name printed in the Community Foundation’s annual report and other donor lists published by the Community Foundation. What information do we collect? We only collect information about you when you fill out a form or make a donation or purchase on our website. When making a donation or purchase on our website, as appropriate, you may be asked to enter your name, e-mail address, mailing address, phone number, and credit card information. The information that we collect from you is given to the Community Foundation with your awareness and consent. Anyone can visit our website without revealing any personal or contact information. If you choose to provide personal information to the Community Foundation for the purpose of correspondence, or processing a donation, then it is our intent to let you know how this information will be used. We aim to improve what our website has to offer based on the feedback that we receive from you. We do use “cookies” to track user information; this information is gathered to help improve the overall user experience of our website. By studying traffic patterns of visitors using our website, we can use the information gathered to improve the overall experience of our website. Please see Section VIII “Use of IP Addresses and Cookies” for greater detail. Your information will never be sold, exchanged, transferred, rented, or given to any other company for any reason whatsoever without your consent. The information that you provide to the Community Foundation in order to process a transaction will only be used for that purpose. The Community Foundation does not retain your credit card account information. We use commercially reasonable efforts to make sure that your credit card information is kept strictly confidential by using only third-party processing services that use industry-standard encryption technology to protect your credit card information during the transaction from unauthorized use. The e-mail address that you willingly provide to us will be used to send you information, and may also be used to send you periodic news about the Community Foundation. If at any time you would like to unsubscribe from our mailing list, we include clear, easy unsubscribe instructions at the bottom of each e-mail. When your information is used for these reasons, we do so with respect for your privacy. Your personally identifiable information is never disclosed, sold, shared, loaned, rented, or otherwise transferred to a third-party vendor for any reason. The content on this website is the property of the Community Foundation. If you would like to use or adapt content from this website for a nonprofit organization or an educational institution, please contact us at 860.347.0025, and we would be happy to assist you. We ask that you acknowledge the Community Foundation in any reproduced content. The content of the Community Foundation’s website contains links to external sites that do not fall under the www.MiddlesexCountyCF.org umbrella. Please be aware that the Community Foundation is not responsible for the privacy practices or the content of these external sites. We encourage you to be aware when you leave our site and to read the privacy policies of each website that collects Personal Information. A unique number called an IP address identifies every computer on the Internet. Each time you connect to the Internet, your computer is assigned an IP address. When filling out forms on the Community Foundation’s website, your IP address will be captured with the information you submit. Your IP address is given the same level of security and user confidentiality as your donor information. As with all information collected by the Community Foundation of Middlesex County, your information will never be sold, exchanged, transferred, rented, or given to any other company for any reason whatsoever without your consent. You can set preferences on your browser to inform you when a cookie is being placed so that you have the opportunity to decide whether to accept or decline the cookie. If you are just browsing our website and are not a registered user, you do not have to accept a cookie and you can still continue browsing the website. However, if you are visiting a website where you will be accessing a confidential account, you must accept that site’s cookies because they are essential for site administration and more importantly, security. If you have questions about your information or this policy, please contact the Community Foundation of Middlesex County at 860.347.0025.